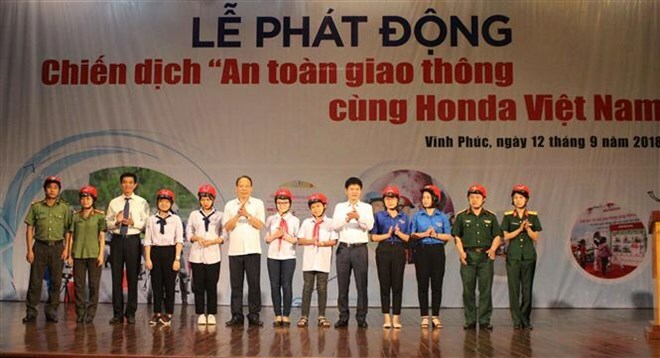 More than 500 young people of the northern province of Vinh Phuc attended a local traffic safety campaign launched on September 12 by Honda Vietnam Co. LTd. and the provincial People’s Committee. The campaign, the fourth of its kind in Vietnam, aims to raise public awareness of traffic safety with various programmes such as traffic safety teaching for more than 1,000 local students and safe driving practice for workers of Exedy Company at Khai Quang Industrial Park. Speaking at the event, Chief of Office of the National Traffic Safety Committee (NTSC) Nguyen Trong Thai said that traffic accidents have been a global issue. It poses a formidable challenge for Vietnam and other countries across the world, he said. In the first eight months of the year, traffic accidents killed 5,366 people, and injured 9,200 others, Thai said, adding that 23 people die and 60 are injured by traffic accidents on average each day. The NTSC chose “Traffic Safety for Children” as the theme of the Traffic Safety Year 2018, aiming to reduce the number of children involved in traffic accidents by 10 percent from the year before. According to Phung Van Hue, a representative from Honda Vietnam Co. Ltd., the firm will work with the Ministry of Education and Training to carry out traffic safety education in schools, organise safe driving contests, and present more than 5,000 helmets to first-grade students. At the launching ceremony, Honda Vietnam presented 1,000 helmets to the province’s Traffic Safety Committee, and organised a street parade to popularise the message of traffic safety to local people.